In September 1981, several of the visionaries left Medjugorje to attend various schools. This, too, was Vicka’s plan, but Our Lady said it was not good for all to leave. Our Lady asked Vicka to stay at home and look after young Jakov, who was still attending primary school. Vicka readily agreed and her daily life then became that of a peasant woman who worked regularly in the fields. 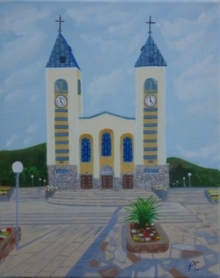 She discovered, however, that her time would become more and more taken up with the tens of thousands of pilgrims who were pouring into Medjugorje, week after week, as people from around the world began discovering the reported events taking place in the village. Often times, pilgrims showed up at her house as early as 6 a.m., and as they left, new ones arrived. Sometimes there would not be even time enough to stop and eat, and yet her patience and smile were constant and steadfast. With the other visionaries often gone and Jakov too young for such responsibility, Vicka took upon herself the burden of being Our Lady’s witness to the multitudes who came looking to understand the truth behind the events of the apparitions. Our Lady, on a surprise visit, took Vicka and Jakov with Her to visit Heaven, Purgatory and hell. Vicka was moved to great compassion for the souls in Purgatory. Vicka asked Our Lady if there was something she could do to help them, if she could offer herself for their expiation. Our Lady accepted her offer when She was certain Vicka understood the seriousness of what she was asking. Shortly afterwards, a mysterious illness afflicted Vicka, causing her to suffer from extremely painful headaches and high fevers that were so severe, she would often fall into comas.2 Often during these episodes, she was semi-conscious and obviously suffering,3 though she always would awaken a few minutes before Our Lady’s apparition each evening and appear smiling and happy. At one point, her mother begged Vicka to ask Our Lady to cure her, but Vicka responded that if her mother knew how much good her suffering was doing for the poor souls, she would not ask this of her.4 In January 1988, Our Lady told Vicka her suffering would soon come to an end, giving her the exact date her illness would disappear, though she was to tell the date to no one with the exception of her confessor. The commission investigating the apparitions was given the date in a sealed envelope. On September 25, 1988, the headaches and symptoms disappeared, never to return. Members of the commission, upon opening the envelope, discovered the same date therein. Through these years of carrying this cross, Our Lady brought Vicka through the school of suffering, an education that has helped countless individuals learn how to accept suffering with joy. She became a witness not only for all those who carry the cross of physical illnesses or handicaps, but for all people who carry a cross, whatever shape or form it may come in. Our Lady has often asked Vicka to offer up other sufferings as well, the most difficult being to give up her daily apparitions for extended periods of time. This has been asked of Vicka on several occasions over the years. She suffers these times of not seeing Our Lady for specific intentions that Our Lady has asked of her. Vicka is also the visionary to whom Our Lady chose to reveal Her life story. Though all the visionaries were given glimpses of Our Lady’s life on Earth, it was given for them only, not to be shared. But to Vicka, Our Lady instructed her to keep a careful record of these special dictations, given from January 7, 1982 to April 10, 1985. She is not allowed to show anyone the notebooks that contain Our Lady’s life story until she receives from Our Lady the date upon which they can be released. After twenty years of devoted service to Medjugorje pilgrims, Vicka married on January 26, 2002 at the age of 37. She and her husband and two children now live in Gruda, a small village a few miles north of Medjugorje. Vicka’s life is more private now, though she still makes herself available to pilgrims from time to time. She continues to see Our Lady every day in the apparitions, has received nine secrets, and awaits the 10th, along with Marija and Ivan. She, no doubt, continues to suffer for the plans of Our Lady to be fulfilled, though we will never know for certain, as that smile will always hide the cross that she carries.